The National Highway Transportation Safety Administration (NHTSA) and the American Academy of Pediatrics have issued new safety recommendations to protect young children from motor vehicle accidents. They are advising parents to keep children in rear-facing seats until age two, or until they reach the maximum height and weight requirements for the seat. The previous recommendation from 2002 was also for children to ride in rear-facing car seats until they reached the maximum height and weight requirements – or until the child had reached a minimum of age one and 20 pounds. Using this standard, many parents turned the car seats around when their child reached age one. The NHTSA and the American Academy of Pediatrics issued the recommendation citing a 2007 study in the journal Injury Prevention, which showed that children under age two traveling in rear-facing seats are 75 percent less likely to die or suffer severe injuries in car accidents. The two groups made additional recommendations for booster seats, saying children should ride in them until they have reached four feet nine inches tall and are between eight and 12 years old. The groups also recommend children ride in the backseat until they are 13. The new recommendations come as motor vehicle accident deaths among children under age 16 have decreased significantly in recent years – 45 percent between 1997 and 2009, according to the American Academy of Pediatrics. But motor vehicle accidents remain the leading cause of death for children ages four and older. More than 5,000 children, teens and young adults up to age 21 die in motor vehicle accidents each year. For every fatality, 18 children are hospitalized and more than 400 require medical care. Massachusetts law requires child safety seats to protect children from car accidents. 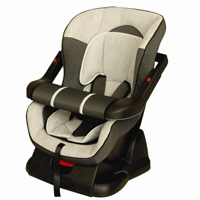 Children must be secured in child safety seats until they turn 7 years old. Click here for more details about Massachusetts’ Child Passenger Safety Law. The Boston car accident lawyers at Breakstone, White & Gluck represent individuals injured in motor vehicle accidents. With over 80 years combined experience, our Massachusetts car accident lawyers are knowledgeable, experienced and have the resources to handle your case. If you have a case, contact us today at 617.723.7676 or use our form. Tagged: "Boston car accident lawyers", "car accidents", "child car seats", "Massachusetts car accident lawyers" and "motor vehicle accidents"